Perhaps no living author of imaginative fiction has earned the awards, accolades, respect, and literary reputation of Gene Wolfe. His prose has been called subtle and brilliant, inspiring not just lovers of fantasy and science fiction, but readers of every stripe, transcending genre and defying preconceptions. In this volume, a select group of Wolfe's fellow authors pay tribute to the award-winning creator of The Book of the New Sun, The Fifth Head of Cerberus, Soldier of the Mist, The Wizard Knight and many others, with entirely new stories written specifically to honour the writer hailed by The Washington Post as "one of America's finest." 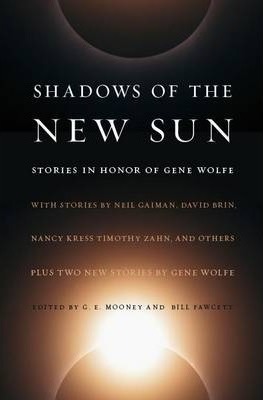 Shadows of the New Sun features contributions by Neil Gaiman, David Brin, David Drake, Nancy Kress, and many others, plus two new short stories by Gene Wolfe himself. Praise for Gene Wolfe "Gene Wolfe remains a hero to me.... He's the finest living male American writer of SF and fantasy--possibly the finest living American writer." --Neil Gaiman, author of "American Gods ""Gene Wolfe is the greatest writer in the English language alive today. I mean it. . . . Among living writers, there is nobody who can even approach Gene Wolfe for brilliance of prose, clarity of thought, and depth in meaning." --Michael Swanwick, author of "Dragons of Babel""Gene Wolfe is the finest and most subtle short story writer active in the field today." --David Drake, author of the Lord of the Isles series "Gene Wolfe is a national treasure." --Damon Knight, author of "To Serve Man" "Wolfe is our Melville." --Ursula K. Le Guin, author of "A Wizard of Earthsea" Praise for Gene Wolfe"Gene Wolfe remains a hero to me.... He's the finest living male American writer of SF and fantasy--possibly the finest living American writer." --Neil Gaiman, author of "American Gods""Gene Wolfe is the greatest writer in the English language alive today. I mean it. . . . Among living writers, there is nobody who can even approach Gene Wolfe for brilliance of prose, clarity of thought, and depth in meaning." --Michael Swanwick, author of "Dragons of Babel""Gene Wolfe is the finest and most subtle short story writer active in the field today." --David Drake, author of the Lord of the Isles series"Gene Wolfe is a national treasure." --Damon Knight, author of "To Serve Man""Wolfe is our Melville." --Ursula K. Le Guin, author of "A Wizard of Earthsea"
Bill Fawcett has been a professor, teacher, corporate executive, and college dean. His entire life has been spent in the creative fields and managing other creative individuals. He is one of the founders of Mayfair Games, a board and role-play gaming company. As an author, Fawcett has written or coauthored over a dozen books and dozens of articles and short stories. As a book packager, a person who prepares series of books from concept to production for major publishers, his company, Bill Fawcett & Associates, has packaged more than 250 titles for virtually every major publisher. He founded, and later sold, what is now the largest hobby shop in Northern Illinois. J.E. Mooney is the co-editor of Shadows of the New Sun. GENE WOLFE is the Winner of the World Fantasy Award for Life Achievement, as well as the Nebula Award (2), the World Fantasy Award (3), the John W. Campbell Memorial Award, the British Fantasy Award, and the Prix Apollo. He was inducted into the Science Fiction Hall of Fame in 2007.